Many people have been asking for eBooks to download in PDF format so I created low resolution files to accommodate the requests. These coffee-table-sized books are much more than just normal photo books, they are a photographically illustrated, collection of non-fictional short stories that as a whole become a cohesive short novel. All 3 volumes are interconnected but they each can also stand alone. Volume 1 is a about a physical journey traveling across the U.S. in a motor home after becoming homeless following a disastrous hurricane. Volume 2 picks up where Volume 1 left off by embarking on another physical journey in the motor home but evolves more into a mental and spiritual journey involving a parents’ personal tragedy. And Volume 3 follows the struggle to get through that tragedy and find hope, eventually coming full circle with a Hollywood-esque ending. Interwoven in all the volumes are amazing stories of coincidence and serendipity that surround the mysterious lost shoes littering the highways. Many of the discovered shoes become Lost Sole dedications to actual lost souls who passed away on the same day as the shoes were discovered. The full-color, 56 page books are all photographed, written, and designed by award-winning artist, Randall Louis Hamilton. Currently they are only available for purchase online and at gallery showings. These books must be seen to be appreciated and ebooks can be downloaded for free using the links below. Be sure to check out the interactive map of all the lost soles Randy has discovered across the U.S. plotted out utilizing GPS coordinates. I invite you to download all three. I just ask that if you enjoy what you see and read, please buy a book. They make very unique gifts :) These books take a lot of work to create. They are true labors of love. I do everything in regards to their production: write, photograph, lay out the design, edit, everything except physically print them. Viovio.com does that for me. And please feel free to send the PDFs to anyone you think might be interested in looking at it. Anything you can do to generate exposure for the project is greatly appreciated. I am currently working on combining all 3 volumes into one larger, hardback volume. Please check back for availability. 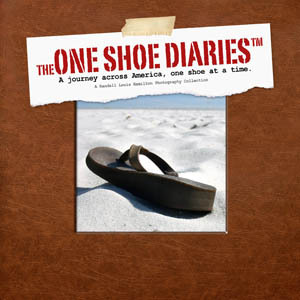 Volume 1 focuses on our journey from South Florida to Northern California after losing our residence on Pensacola Beach, Florida to Hurricane Ivan in 2004. Instead of taking it as a disaster, we took it as an opportunity to live full-time in a motor home and tour the country in search of adventure, all the while photographing all of the lost shoes we discovered. We took the southern route of I-10 through Florida, Alabama, Mississippi, Louisiana, Texas, New Mexico, Arizona and eventually California. Over the course of the journey we encountered flat tires, small fires, running out of fuel and at times out of money. Some of the highlighted shoes were a flip flop in Pensacola, a cowboy boot in Austin, a high heel in Hollywood Hills, plus many more. We discovered and photographed over 150 lost shoes and gained an immeasurable amount of life experience. In volume 2 we continued our adventures in the Cruise Master motor home by circling around the East Coast. We explored from Florida to Ohio to Maryland and back, eventually settling down back in Pensacola where the first journey began. All the while discovering more lost shoes, or what I now call, lost soles. This volume focuses a little less on the travel aspect, and more on the stories that we want to tell about the people in our lives that mean the most to us. We endured extreme highs and extreme lows during the time frame in which this volume takes place. We were shocked when we found out we had conceived a baby, which turned to elation, only to become despair when it turned into tragedy. Soon after we experienced the passing of our son, Noah Charles Hamilton, amazing and unexplainable events brought true hope back into our lives like a tidal wave. We wrote this volume despite being extremely hard to do so, in order share the experience we had to perhaps help others who have to go through the same horrible experience find hope. I would like to thank everyone who has supported us in this endeavor. 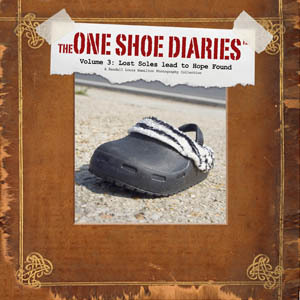 It has been really fun to get all of the emails and messages about other’s lost sole experiences. Some of which have been sad, others humorous, but most of all they have enriched and reshaped our view of this world. Just as the other Volumes, Volume 3 follows Sharon and Randy’s journey through life’s ups and downs. It begins with two people surviving every parent’s nightmare, to healing as a couple, eventually experiencing every parent’s greatest moment. Along the way it dives further into the almost other-worldly connection between the lost soles and actual lost souls. I am very proud of this volume. It has so many levels to it and echoes back to experiences from earlier volumes that once seemed insignificant, but now revealed as very important events that shaped our lives. 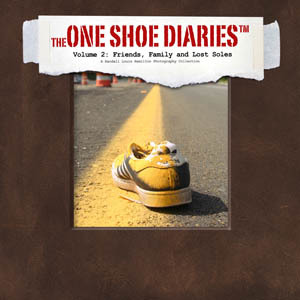 In essence this volume brings the One Shoe Diaries full circle. The ending is so perfect and Hollywood-esque, that if I had not personally experienced it and had witnessed it, I would not believe it was genuine. Following up on this Volume will be a tough act. However as evidenced in the One Shoe Diaries, life always has forks in the road. You never know what is store. Life is an adventure for sure.